Alright, this post is a two-fer, food and drink. One of my favorite things about having a garden again is having fresh herbs. I believe for two bucks you can get three sprigs of organic cilantro at Trader Joe’s or for about three bucks a bunch of organic parsley from Whole Foods. I use fresh herbs almost daily so I had to drastically curb my fresh herb habit over the past three years of garden hiatus (a.k.a. having two children and finishing a PhD while husband finishes medical fellowship) to avoid going bankrupt. Given my proclivity for herbs, I thought I would post on how I used three of them the other night in a favorite green tea infusion and a fabulous cooked spring salad to accompany homemade focaccia. 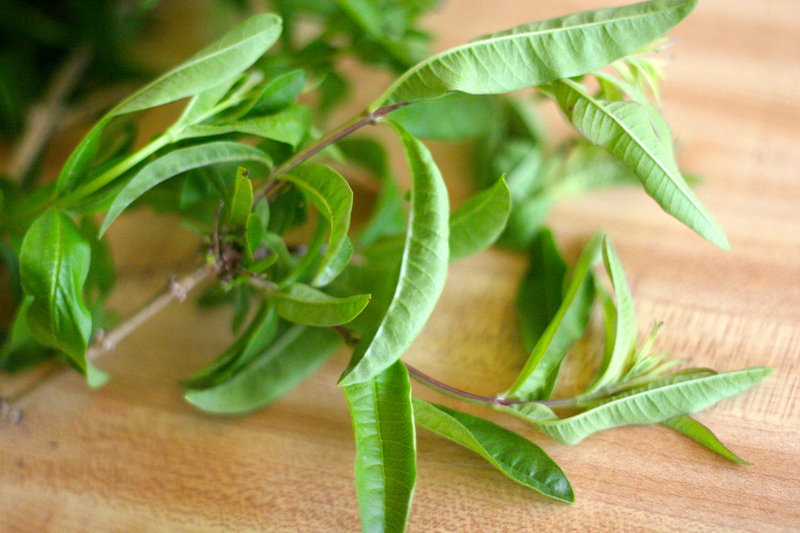 Lemon Verbena is a pretty magical herb. If I told you that it was the closest I have ever come to tasting a sophisticated bottled up essence of Lucky Charms it probably wouldn’t seem that alluring to you (unless you knew that we did not eat sugar cereals growing up and that was hands down my favorite one for special treats). Well, if you haven’t ever smelled Lemon Verbena you are missing out. You simply need to brush by a single leaf and the whole air is perfumed with a warm, heady perfume. It really doesn’t smell lemony to me at all, but maybe closer to a mix of lemons and their blossoms. This past week I made a syrup to use on lemon verbena cupcakes and to whip into whipped cream for a make-your-own meringue bar at my sister’s bridal shower. I loved them so much I decided to go for a non-sweet version of lemon verbena iced tea. The iced tea infusion is a cinch. In fact, a recipe is overstating things. You boil a pot of water, take it off the heat and add loose gunpowder green tea and several sprigs of lemon verbena and let it sit for ten minutes or so. Filter out the loose tea (unless you encased the tea leaves in tea balls, in which case just take them out) and leave in the lemon verbena, if you like. 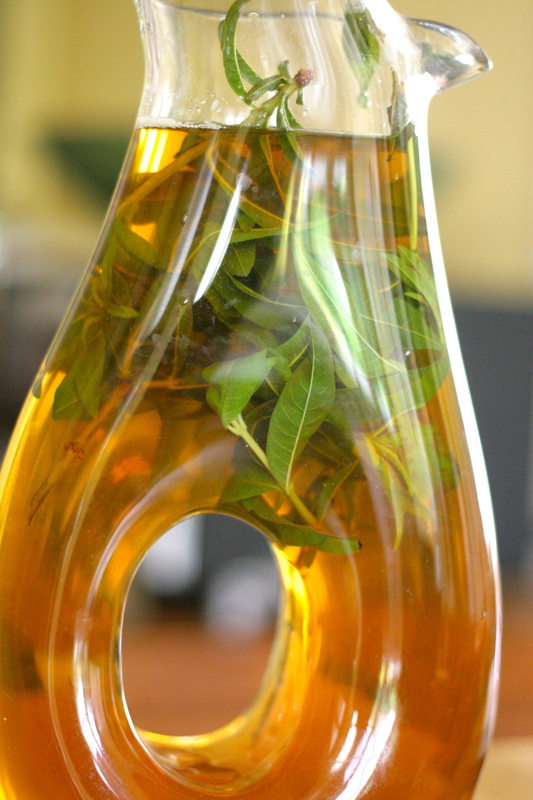 It does not need any sweetening, but if you like sweetened tea (which I generally do not except hot Moroccan mint tea) you can make an exceptional syrup by boiling equal parts sugar and water, take the syrup off heat and add more lemon verbena and let it cool. Add this for a fragrant sweetener. The next two herbs, humble ones that you probably have used in a pasta sauce or roasting a chicken, are thyme and parsley. 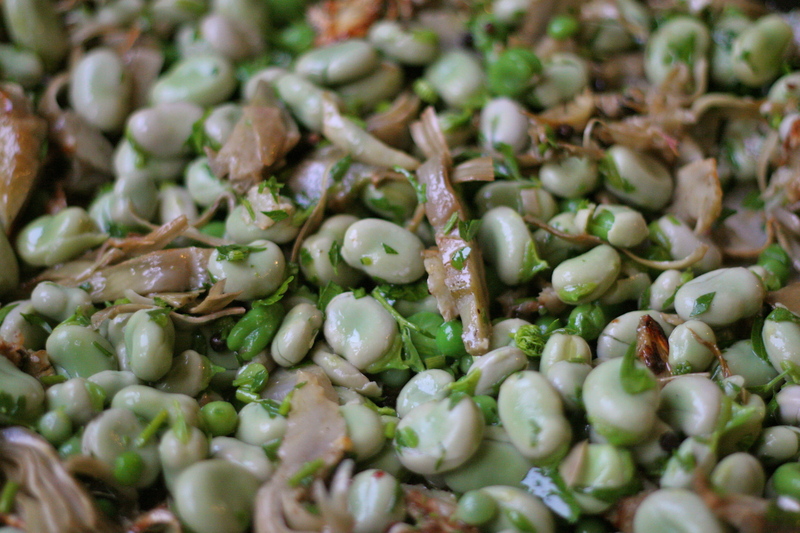 Last spring I made a lovely topping for crostini/bruschette with artichokes, freshly shelled peas, and fava beans and I wanted to do something a little different with our first pick of the glut of fava beans growing in our yard. Just picked peas, favas, parsley, and thyme. I then roasted them with some lemon, garlic, thyme, and peppercorns and added barely cooked fresh peas, fava beans, and parsley, once they were done. It was a blissful dish and the peppercorns were surprisingly spicy without overwhelming the other flavors. This is a dish with a lot of wiggle room when it comes to your herb garden. You could swap in shallots or onions when cooking the artichokes instead of the garlic. If you want to be traditional, you could add some freshly minced mint instead of, or in addition to the parsley at the end. If you prefer less bite, you could dry roast the peppercorns and add them near the end instead of baking them with the artichokes together (the spicy peppercorns surprisingly permeated into whatever artichoke surrounded it, which I liked a lot). 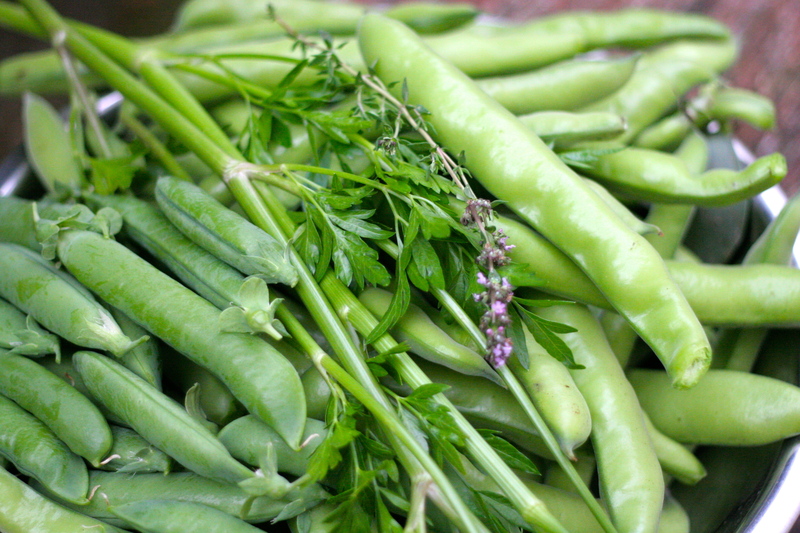 Finally, you do not need to shell fresh peas and favas yourself, we just happened to have them in the garden. This would be fine to make quickly with frozen favas or peas. And it is just delicious with freshly baked focaccia (which may make an appearance here very soon). Heat the oven to 400F degrees. Have a bowl full of cold water at hand and squeeze half of one lemon into the water. Remove the outer third of leaves and then slice each artichoke in half from the tip down to the stem (lengthwise) and immediately rub the cut sides with one of the lemon halves. Carefully remove the furry “choke” from the middle of the artichoke with a small knife. 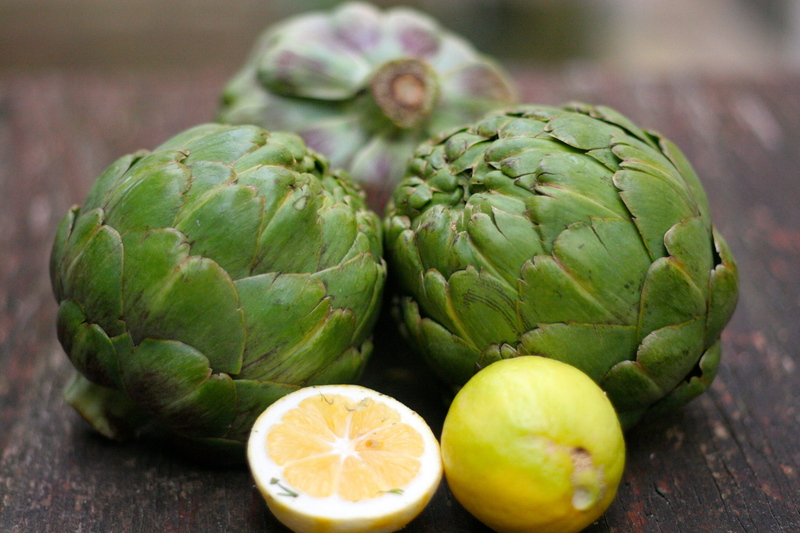 Place the unchoked artichokes into the cold lemony water. Working one half at a time, slice each artichoke thinly lengthwise again (as if you were doing melon slices), about 1/8 inch thick and place on a rimmed baking sheet. Toss with olive oil, garlic, thyme sprigs, and peppercorns and squeeze two halves of the lemon and bake for about 20 minutes. Meanwhile, heat a pot of salted water and barely cook the peas and favas together. If you have really large, harder fava beans, you may want to double peel the favas. If you have never done this before, you pinch each fava bean until the light green skin of the fava comes off (I left mine on this time) to expose a bright green inside. Drain them and rinse in cold water to stop the cooking. Mince the parsley (and mint if you want to add that or substitute it). Let the artichokes cool for a couple of minutes after removing from the oven and then mix with the favas, peas, parsley, and salt to taste. If you feel it needs a little more lemon juice or a drizzle of fresh olive oil, feel free. Boil about 5-6 cups of water and take off heat. Add the lemon verbena and the green tea. After 5-10 minutes of brewing, remove the tea (or pour into another container through a mesh filter). I put back the lemon verbena sprigs while it cools. Serve with ice. 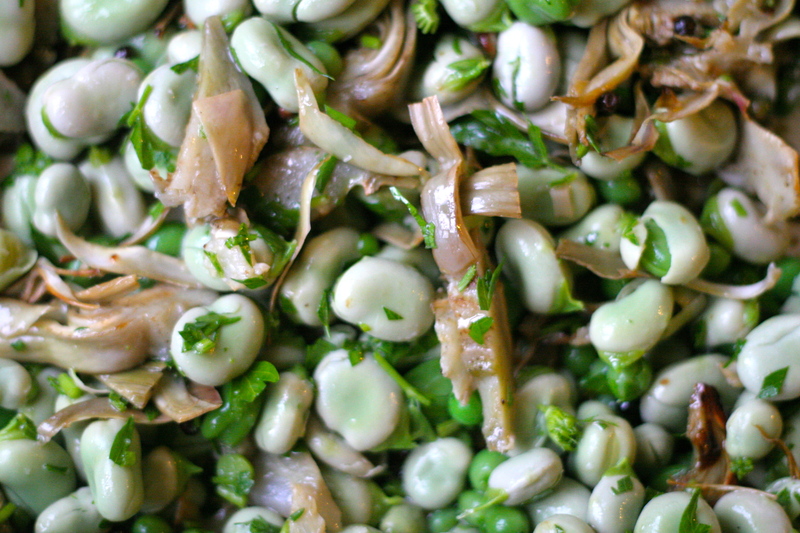 This entry was posted in Artichokes, Dinner, Fava Beans/Broad Beans, Peas, Vegan and tagged fava bean salad recipe, Fava Peas Artichoke salad, lemon verbena green tea infusion, what to cook from herb garden, what to do with lemon verbena. Bookmark the permalink. That salad on your homemade focaccia sounds wonderful. Our herb garden is loving the warm weather right now, so I am trying be more creative and resourceful in making good use of them. Thanks for the inspiration! (Oh, and that tea looks so good – I bet it has a really lovely aroma). Thanks. 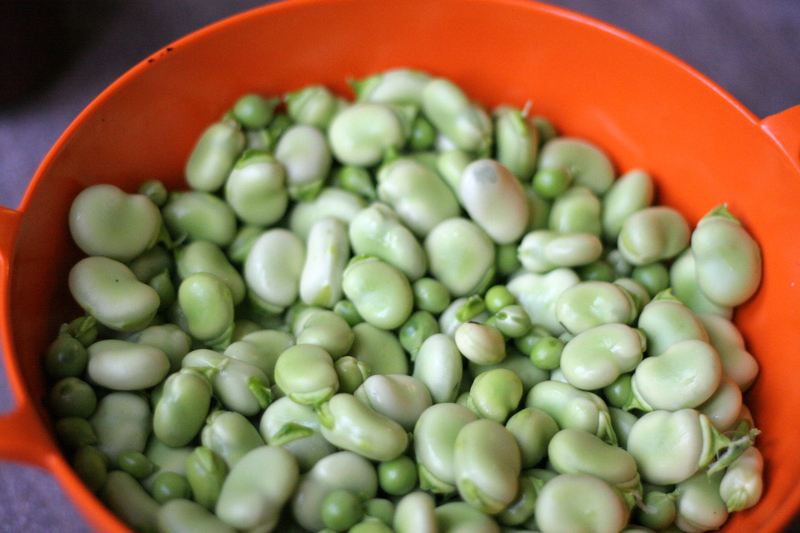 I have more favas and peas so another recipe coming soon….